What The Faux: Chicken run! I've been pretty busy recently but somehow I managed to paint the bonejacks (Two Deathrippers and one Defiler, commonly referred to as 'chickens'). I've never painted WM minis before so it was a refreshing experience. The quality of the sculpt is amazing and the level of detail is quite impressive. Needless to say, painting them was fun. Since these are the first minis for my Cryx army I wanted to set some kind of color scheme. The minis will be used for gaming so I aimed for a quick paintjob that would give a nice effect, i.e. solid tabletop quality. Overall, it took me two evenings to paint them. I went for a dark look with bright green and some weathering. I also used two different methods for painting the bones. I tried to go for an old, worn out look (after all these parts are supposed to come from skulls and fangs of some kind of beasts). I also decided to add some brighter colors to the bases. These bonejacks are painted using rather dark colors so I thought that some contrast here will be a good idea. Now, time to paint the first bigger 'jack - Slayer. I'll probably post a pic of this one in about a week. Until then, take care. 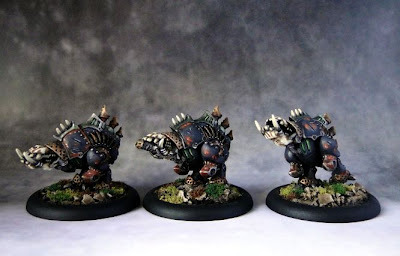 Very nicely painted minatures. 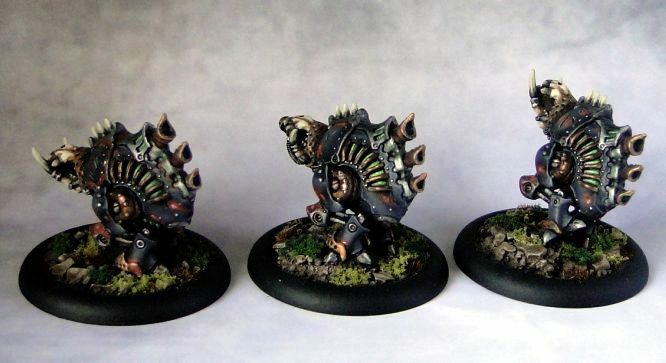 In my opinion they present much better then orginal chickens from catalogue however I don,t like the rust but I think that it is a little detail which do not outshine the whole effect of minatures. Good job!